I have a new home for some special vintage ornaments for Christmas this year. When my Dad sold my Grandparents' home in Florida several years ago, he brought me some of their vintage ornaments. They are priceless to me, not matter what they look like! Usually, they are placed on my tree with the other ornaments. But last year, a few broke and I don't want to take the chance this year. 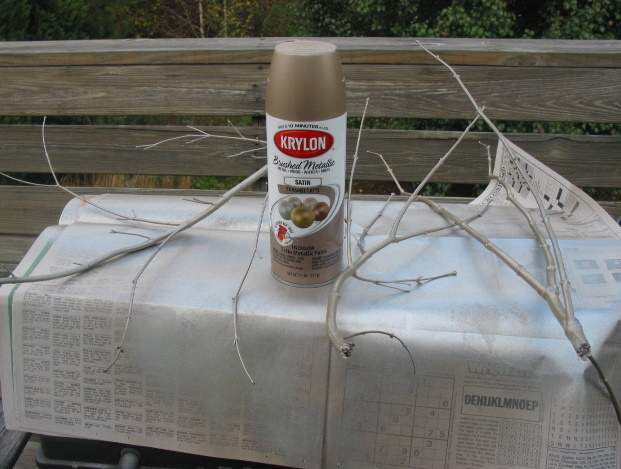 So I cut a few branches from a tree in the yard, then painted them with my newest spray paint obsession - Krylon's Brushed Metallic Caramel Latte, the most beautiful shade of soft gold. 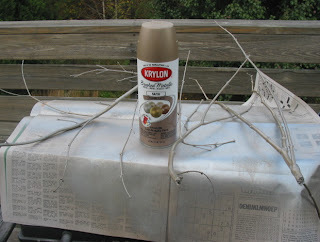 After the branches dried, I trimmed them up and placed them in one of the hurricanes I made earlier this year from a couple of pieces I bought at Goodwill. 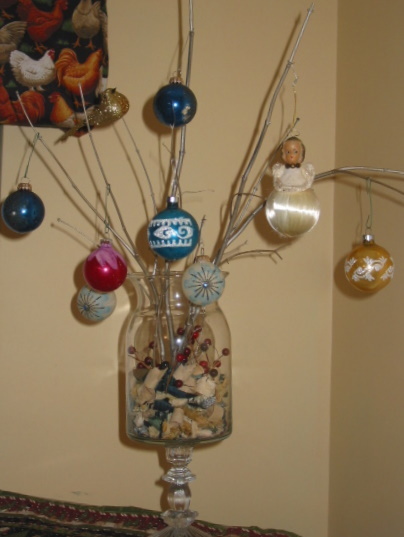 I added some potpourri & berries inside, and then hung my vintage ornaments from a few of the branches. I LOVE IT! I don't know where I'll be putting it for the holidays, because it's gotta be out of the way so none of my special ornaments get knocked off or broken. Anyway, here are a couple pics. I'm really pleased with how it turned out! What a lovely way to display these very special ornaments. So glad you have some of your grandparent's.